After being regarded as the capital of Uttrakhand, Dehradun has shown immense growth in education & housing sector. The city has opened doors with high development on course, for major families from metro cities. People working with different metro cities are also now opting for Dehradun. Surely adding to the reason why people have been searching 3 bhk apartment in Dehradun. When talking about the overall growth for Dehradun as a city, real estate has played a significant role in meeting the same thought of educating population with a new & modish housing experience like never. People have already been interested in buying property in Dehradun and searching for even 4 bhk in Dehradun. 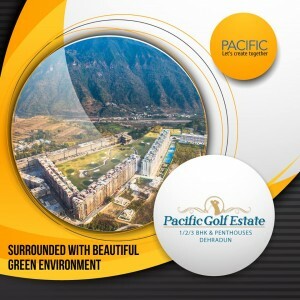 And when being specific, Pacific Golf-Estate has been the key. After getting applauded with a huge response for Pacific Hills, the group introduced the world to this architectural wonder, further making people search for even 1 bhk apartment in Dehradun. The project stands tall in the beautiful location of Sahastradhara road in the main city. The project is spread over 35 acres of green landscape with exclusively Ace Golfer designed 9-hole signature golf play. The project doesn’t restrict towards keeping the availability as the project also has to offer 1 & 2 bhk apartment in Dehradun. The project has already received its half price as phase 1 is Sold Out. But you still can try with your luck as a possession for phase 2 has started. The area is considered to be the poshest area to the near-by places and is surrounded with a beautiful green landscape in the lap of the Himalayan range. The area is also close to all major places in town. The group also offers, facilities like Squash, Clubhouse tennis, etc. This project has been reviewed by major housing experts as the best place to live.